Take just the trotters, remove their large bones, and braise them in plain chicken broth. The flavours of the tendons and trotters are similar and match each other well. In fact, if one has a good ham hock with the trotter  it can also be cooked with the tendon to support its flavour. : Just what does he mean by braising with a “chicken market/factory/arena” (雞肉場)? Google this section of Suiyuan Shidan and we see that 場 was not a typo from Wikisource but rather it was printed this way in the actual text. In reading the sentence as whole, I’m tempted to believe that the Qing Dynasty typesetters that put together the First Edition of Suiyuan Shidan most likely made a mistake, erroneously setting the sort for 場 instead of 湯 (soup/broth). This changes the statement from something that would have been expected: “stew using clear chicken broth” (用雞肉湯清煨之), to something completely non-sensical: “stew using a clear chicken market” (用雞肉場清煨之). I’m going with the “broth” and dumping the “market” interpretation. 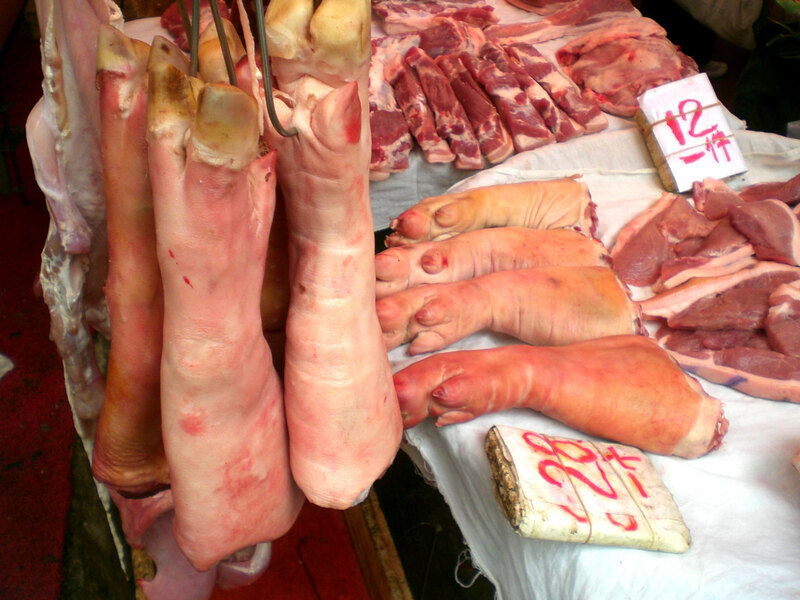 : 腿爪 (tuijua) means “leg and trotter” which likely refers to the ham hock (and a bit more) still connected to the trotter. Though it could also mean the entire ham with the trotter, it’s rare in Chinese cooking to cook the entire ham together in one dish in the manner similar to a Western Roasted ham.